1.Your work is very organic and pure in its form, why do you predominantly choose this style for your turnings? It's a way to encapsulate a look and feel into forms and shapes that I can relate to. 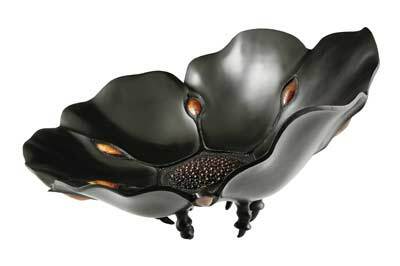 Organic forms are full of inspirational shapes and have sculptural elements that appeal to me. I try to combine them with what I see in the wood. This is a tacit agreement that I have with wood, meeting what I have to say, with what the wood has to offer. It's an ever-evolving process that I hope that other people can relate to as well. 2. What are the primary sources of inspiration for your turnings? I like the interaction of light with form and am drawn to the lines and curves that light creates on objects and to the patterns and textures that result. The bits and pieces that surround me in my life are painted by light and often accentuate a particular texture and shape. This might be the basis of a piece I am making. 3. How have your Hawaiian surroundings influenced the work you produce? To live in Hawaii is to be immersed in the land, sea, and a culture with a reverence for bowl making. These are a part of everyday life. Here, there is an understanding that respect for the land, and for the materials that come from it, will find a way be a part of the work that you do. I was raised to accept wood as a living entity in an environment that values the appreciation of organic and classic forms. 4. What is your current pet hate, and your like? There are actually a couple of things that I could do without. One is the notion that a nice piece made from a less popular timber is somehow not as good as it could be. Next would be that art is the result of our mistakes which has meaning that is too obscure for ordinary people to appreciate. What I do like is that I am now old enough that I no longer have the need to take myself too seriously or to subject others to that particular form of torture. 5. If you could change one thing relating to turning, what would it be, and why? I think woodturning needs to become self aware. It is often difficult for turners to embrace their contribution to the arts and crafts community. The work that we do is evolving and who we are as creators has grown beyond bowl making. There is never going to be a resolution to the craft versus art debate, or to the never, ever, ever, paint the wood argument. Most pieces exist as a result of personal experiences focused with the passion for creating objects and we have to accept that a finished piece represents what the maker has to say at the moment. 6. With regards to your career do date, what regrets do you have, if any? None really. Maybe knowing then what I think I know now. I would have wanted to spend more time working with other artists, but that can still happen in the future. It's a new piece in an old direction. This piece began as a large natural-edged vessel that was roughed out from a crotch that distorted, cracked and radically moved in the process of drying. It has literally given its all to the movement and part of it has almost folded onto itself. I want to keep the organic nature intact so I'm using very sharp carving tools to place details and textures to emphasise the existing flow of lines and curves. I want a 'just wood and tool' piece without resorting to sanding. I think it will bring out the strong visual lines and the polished tool marks will add a nice tactile quality. 8. Who are the turners you most admire, and why? The ones that do the work that you want to know more about. There are a lot of them. This is not a straightforward question to answer. Like most of us, I see turners through the portal of their work. We have pioneers, technicians, slashers, burners, and purists, many of which have done work that has become iconic. I admire the passion and growth they exhibit in their pieces and appreciate the tremendous contributions that they have made to turning. We break a lot of rules in turning. I think we have new generations coming up that don't know there are any rules. Turning will be what everyone allows it to be. 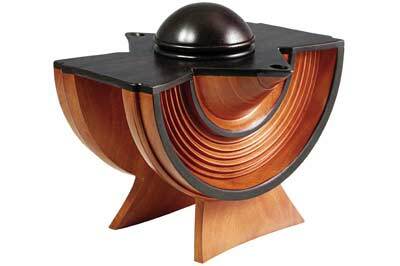 There are few forms of woodworking that have the freedom of form and expression that turning is so good at advancing. How could it not be more than we know now? 10. 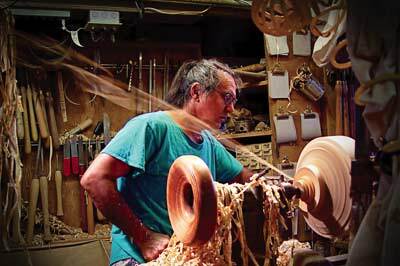 If you could invite one person to an afternoon of turning with you, who would it be and why? Someone who I think would get turned on by turning wood. People don't get what turning is about by talking about it! It's kind of like surfing - my analogy for almost everything - everything happens in the moment and it's good to turn with someone who is in for a ride. I want to be around someone that is excited about the forms that emerge from the timber and giddy about the shavings they make along the way.